What's Missing in Your VIdeo? As we look ahead into the coming year, one thing is for certain; digital media is growing. Sure, traditional media - radio, TV - is still viable and will remain so for the foreseeable future. But new media cannot be ignored, and new means of reaching an audience seem to be developing on a daily basis. It can seem like we no more than grasped the possibilities of a web site than Instagram came along and gave us yet another vehicle. Many of these digital media are visual in their nature, but it's equally important to remember the power of sound in reaching your audience.A trend I'm noticing on YouTube is the lack of narration on many promotional videos. The images are beautiful, the music is usually appropriate of not on target, and there may even be some testimonials on camera. But without a voice over, even just to intro or conclude the video, I feel like the viewer is left with questions. What was the actual name of the city or region in this tourism video? How do you pronounce that guy's name? Sure, graphics can tell part of the story, but people are more likely to retain what they hear. And it needs to be said clearly and distinctly. Don't neglect the audio portion of your video. Show AND tell, with a professional voice over. There's power in your words. It was the highest grossing film of 1954, topping $12 million. That was a lotta dough back then. The Bing Crosby we see in WC is the one we are familiar with: cool and debonair if in a slightly outdated manner. (His use of hep cat slang is a little bit like your grandmother getting a tramp stamp.) But the role that gained him an Academy Award nomination that year was in “The Country Girl.” Where his character, an alcoholic down and out signer, is a light year from type. Danny Kaye was the third choice to play opposite Bing Crosby. First choice was Fred Astaire. (He appeared with Bing in “Holiday Inn” the first film to feature the song “White Christmas.”) Second choice was Donald O’Connor (“Singing In The Rain”) who fell ill.
Danny Kaye got $200,000 plus 10% of the gross. That’s also a lotta dough. Kaye was given an honorary Oscar at the ceremony of March 30, 1955 for "his unique talents, his service to the Academy, the motion picture industry, and the American people." The academy failed to even nominate Kaye for any film performance, including “The Secret Life of Walter Mitty” (1947). The Irving Berlin song Count Your Blessings was nominated for an Academy Award as Best Song, but it was a very competitive category that year. The winner was Three Coins in the Fountain composed by Jule Styne with lyrics by Sammy Cahn. Another nominee was Judy Garland’s signature torch burner The Man That Got Away written by Harold Arlen (“The Wizard of Oz’) with lyrics by Ira Gershwin. Other musical highlights in 1954 include the score for “On the Waterfront,” composed by some new guy named Leonard Bernstein. And another newcomer shows up in the scoring for “The Glen Miller Story” in the name of Henry Mancini. On the dark side: Larry Adler did not get credit for his score for “Genevieve” due to red scare blackballing. He’s not dancing anymore. Reliable sources say that an uncredited Bob Fosse provided at least some of the choreography. That would explain the more modern look of some of the hot dance numbers, particularly “Joshua” and parts of “Mandy.” Dance legend George Chakiris (“West Side Story”) is quite visible. A substitute vocalist looped in Vera-Ellen’s singing. There is conflicting information on who did the singing, most likely due to more than one person doing it. Trudy Stevens gets mentioned most often. And for the “Sisters” number, Rosemary Clooney double-tracked herself covering the whole song, a trick she also used in her hit record of the same year Hey There where she talks back to herself. Yep, those costumes are by Edith Head. The principle photography for “WC” was shot in late 1953, including the Ed Harrison Show scene complete with a real television camera with New York City’s WNTB call letters. By the time the movie was released in October of 1954, New York’s channel 4 had changed call letters to WRCA. Oops. And, unless you grew up in NYC during the period, you wouldn’t know WNTB was the production headquarters for the NBC network. So the inference is that the gang back in Vermont are somehow watching a local New York City TV station. Not very likely with that lousy set-top antenna. We’ll assume the General watches Ed Sullivan… sorry… Harrison on CBS on WCAX in Burlington, which began broadcasting in September of 1954. Art imitates life: Rosemary Clooney's sister is named Betty. It was Betty who talked Rosie into performing in a sister act in their teens, and eventually performed regularly on WLW in the '40's. Some beautiful friendships were born on that Paramount soundstage during the production of "White Christmas." Rosemary Clooney formed a bond with Bing Crosby that lasted the rest of his life. When Clooney suffered a nervous breakdown brought on by, among other things, the assassination of her friend Robert Kennedy, Bing helped her regain her confidence and invited her to join him on a major concert tour in 1975. Bing wrote the forward for Clooney's autobiography This For Remembrance just a month before he died. Rosie also met actor and dancer Dante DiPaolo at Paramount, who eventually became her life partner. She said they'll never get married. Never And now you know where George gets it. They ended up getting married anyway. One person who asked for advice on home studios is responding to me via email, which is why you don't see her comments on this blog. That's OK. She asked a few questions I thought I should post here for everyone's benefit. The Audix OM3 is a good choice, but don't pay too much for it. Comparison shop against the Shure SM58 for the best price. Since bands and major road tours order SM58's by the dozen, Shure can afford to sell them at lower prices. And CAD wants to undercut Shure, so there's a real bazaar going on for handheld dynamics. Take advantage of the free market. Windscreen: aka "mic condom" fits over the mic itself. They tend to "warm" the sound. The way to go for most dynamic handhelds, since you want to get close. Pop Filter: an annoying screen that is attached to the boom stand and held in front of the mic. Some are nylon, others are metal. They are more sonically transparent than windscreens and have no effect on the mic's frequency response. One pop filter can serve all your mics. Highly recommended for touchy condensers, and a must for ribbons. See the photo of Don LaFontaine. Blast Filter: the internal screen built into a mic by the maker. Some are quite good. Most are not enough for close vocal work. Fancypants boutique mics barely put one on, that's why you can see the capsule through the screen from across the room. My Trion 7000 basically has a metal grid around it to protect the innards and that's all. I recommend a good solid boom stand because it'll let you put the mic right where you want it. Quality stands won't tip over easily. Straight stands can be hard to position around a music stand, and I tend to to step on the feet while working, which creates rumble and knocking in the recording. Table stands can pick up rumble from the table, but they're nice if you have limited space. Handheld dynamics roll off the low end of their frequency response usually at about 80 Hz. That means the mic itself is designed to ignore the sub-sonic rumbles of being handled on stage, and the thunderclaps of dancing and cavorting about on stage - another reason they make a good choice as a first mic. You shouldn't have to worry about shock mounting one of these as long you stand still while working. I do like the so-called shock mount clips that come in the box with some mics. They hold the mic with a tight grip. Don't rely on just gravity to hold your mic in the clip. Quick-release clam-type clips are great on stage, but not very secure. If you start collecting mics, you'll find yourself leaving the mic on the mount it came with, and unscrewing the mount from the stand when you want to switch mics. My friend has a friend in Scotland with a Numark DJ mixer. I'm not familiar with the Numark mixer, but it's certainly worth a try. Dynamic mics work well with DJ mixers. Put on the headphones, turn off the speakers, and turn up the mic pot all the way without a mic connected to the back. You'll her some hiss come up, but if you get a lot of hiss, you might want to do some more shopping. At normal operating levels, the mixer should not add hiss to your sound. If you are buying the one from your friend in Scotland, make darn sure it can operate on US voltage. 115-125 volts at 60 Hz. B: the mic exceeds the limitations of the printed circuit preamp built into most of these mixers. Trying to use a ribbon mic with a mixer preamp will make you babble and drool until the men in the clean white coats come to take you away. There's no such thing as a stupid question when it comes to mic cables. While there are variations in how the connectors lock, the XLR connector is an international standard. Ask the dude at the music store for mic cable, and you'll get the right stuff. Any dynamic mic made since approx 1960 uses the same pins for the same thing. The Audix safely fits into the international standard. If it clicks, it fits. Some fancypants condenser tube mics use special cables. Another reason we'll steer clear of those for now. Vintage mics made before Rock and Roll may have different polarity or different connectors, and we won't even try to start on impedance matching those mics. Keep it simple in the beginning, and you'll get good results. And yes, I have seen supposedly pro gear with incompatible XLR connectors. A certain audio board at a certain civic center I know has XLR "line out" connectors that are not standard, thus rendering all output from that board out of phase with a certain television station's equipment. You have no idea how fun it can be to build a phase reversing 3-conductor cable connection in less than a half-hour. My wife pointed out that in last week's post I never really got around to recommending a particular microphone for the starter studio. Maybe indirectly I did, but I covered lot of ground on the entire studio last time, so this time let's just talk mics and get specific. The Starter Mic: Less Than $200. There are dozens of brands making - or rebranding - hundreds of models of microphones for vocal use. That's far too many to choose from. That's the bad news. The good news is that there are a lot of pros out there with years of experience to guide you, either in person or via the web. Now, some of these guys are blowhards with a severe case of Mic Envy, but even those guys wouldn't spend their hard-earned money on a tube condenser if it didn't make them sound good. So, don't just listen to my advice; check around and get as many points of view as you can. You can learn something from any one of us. The mics I mentioned are road-worthy hammers, built to take the punishment dished out by musicians on tour, in clubs, and even on The Tonight Show. Museum pieces like Paul McCartney, David Bowie, and Elton John have been signing into SM58's for decades. Lather on the duct tape and Roger Daltrey can play bolo with one all night. These mics can be dropped, stepped on, sneezed on, barfed on, held in a toilet, (Liar by Three Dog Night) run over by the tour bus, and still sound great. If they an take all that, I'm thinking your Golden Retreiver cheweing on it won't put you out of business. We're talking bulletproof mics, here. Second, these mics are available in your hometown. Chances are, if you walk into your neighborhood music store and ask for a Shure SM58, the dude behind the counter will hand it right to you. Or, he'll point out one of the equivelents I mentioned with a sale price. (CAD's are the Hyundai's of microphones: cheap, but reliable.) If your 3 year-old knocks over the stand and the mic is, against all odds, actually knocked out out of commission, you can easily replace it, without going bankrupt or waiting a week for delivery. Third, even if you hit the Powerball, or Uncle Willie dies and leaves you his vintage Neumann U47 with the correct tube, you'll still want that hundred dollar high ball. Because the world is filled with Golden Retreivers and 3 year-olds, you'll keep the Neumann in its box when danger lurks. And fourth, the shallow pickup pattern of these mics will make up for your lousy studio acoustics. 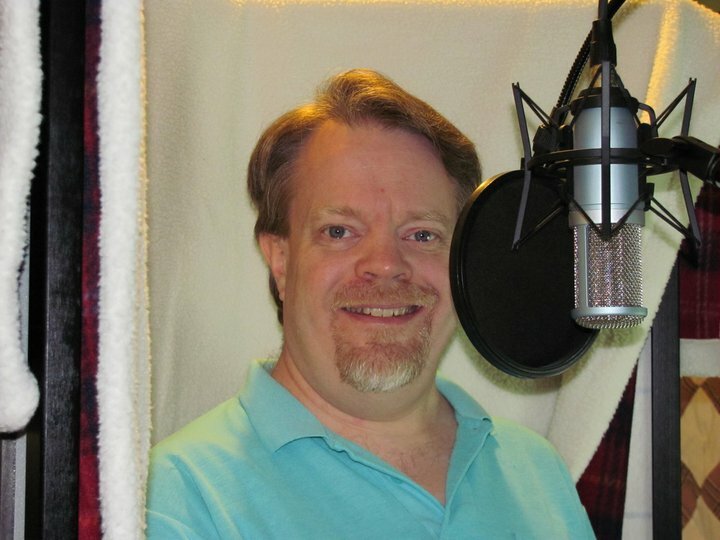 Sure, you could buy a nice Audio Technica studio condenser for under $200, and get nice recordings of your room ringing, your neighbor's lawn mower, an ant walking on a cotton ball, and anything else that wants to compete with your voice. It's uncanny how the fire department knows when you hit the record button and sends every piece of equipment they have down your street. Next post: the upgrade mic. Steve Faul - born in Wilmington, Ohio for no particular reason, I was determined to become a radio personality, vowing, "If this doesn't work, why I'll go into television." I was a DJ on a number of radio stations mainly in Ohio for over 20 years. After my last radio gig, I decided radio is no longer the place for me, and I currently work a local TV station as an engineer and master control operator. Livin' the Dream. I am the regional chairman of the Emergency Alert System for the Lima Area.